Enjoy a diving or snorkeling experience that can only be found in the Florida Keys. Explore any number of our natural or artificial reefs. 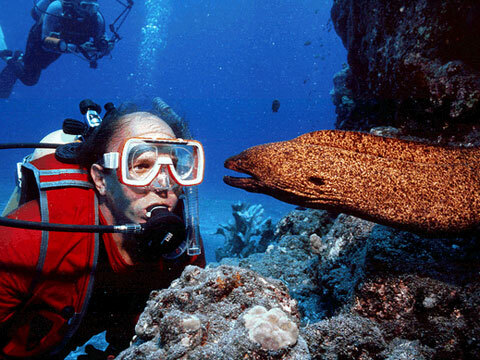 Diving in the Florida Keys has been the talk of diving legends for years and years. The waters of the Atlantic and Gulf hold treasures of all different kinds. There are countless varieties of plants and animals that inhabit these waters and they are all waiting for you to come have a look for yourself. Contact experienced diving guides to give you a guided tour of some of the most beautiful reefs in the world. Those interested in the gorgeous underwater world have their choice of scuba, snorkel, or snuba to get up close and personal with the inhabitants of these fabled waters. As well as the beautiful natural reefs, the Florida Keys are also home to many artificial reeks as well. Whatever your preference, Key West and the Florida Keys welcome to you come, throw on your flippers, and take a peek at the majestic waters surrounding the islands. But remember, a good diver is a responsible diver. The coral reefs surrounding the Florida Keys are precious and it is important treat the reefs you dive at with respect and care. KeysTV.com provides the largest diving guide for Key West and Florida Keys Diving information anywhere! You'll find info about Dive Charters, Dive Centers, Ecological Information, Dive Services and Supplies and Snorkeling.